Smarts Doughnut Review (CLOSED) – Wichita By E.B. After trying to find a location and dealing with legal battles, Smarts Doughnut has finally arrived. 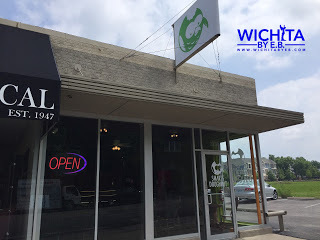 They officially opened their doors last weekend at 3238 E Douglas which is just east of the corner of Hillside and Douglas. 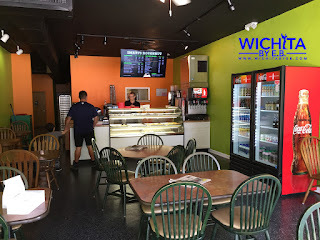 In talking with the staff there, they are still working out the kinks of everything but at the moment plan on opening at 6:30 am everyday and staying open until they are out of doughnuts. I went up there around 11:30 am and they still had some left. If you’re going later in the day, you’ll want to call them at 316-613-2300. 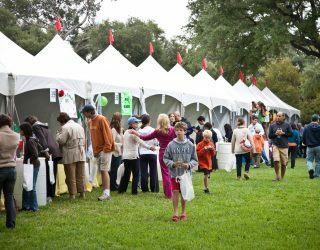 At the moment, they do not have a webpage or any type of social media presence which is almost inexcusable in this day in age. How are people supposed to locate a business? 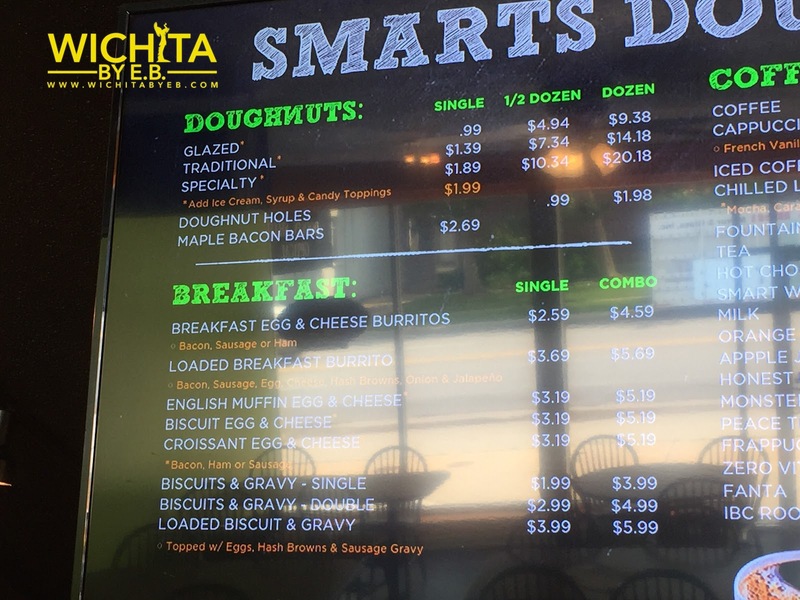 To set Smarts Doughnut apart from other doughnut shops in town, they have an expanded breakfast menu going beyond the doughnuts. They have breakfast burritos, English muffins, croissants, and biscuits and gravy. They have a wide drink selection as well. 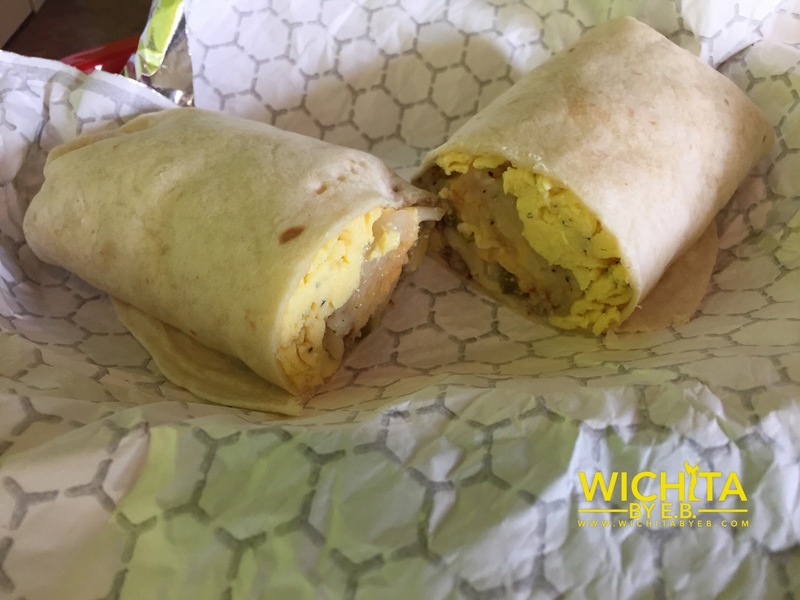 At their recommendation, I started off with the Loaded Breakfast Burrito. They assured me it was their best breakfast item. 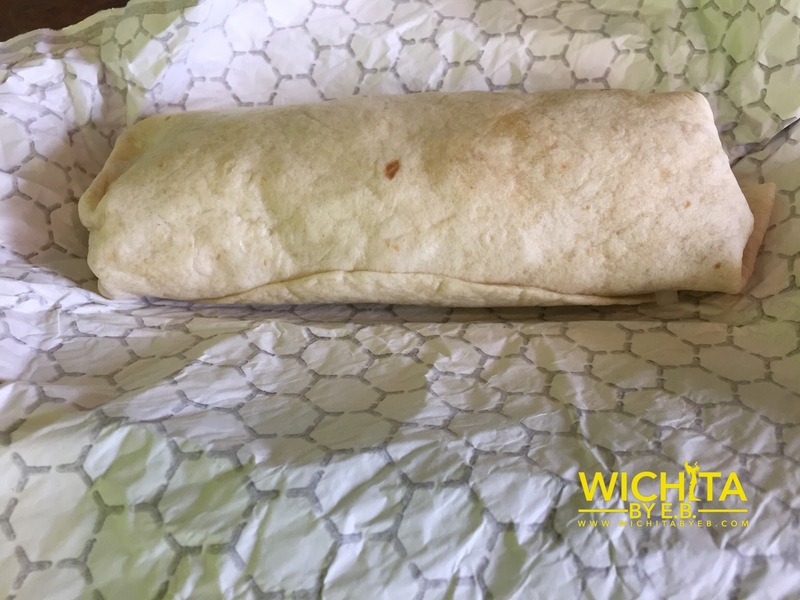 The Breakfast Burrito was made fresh to order and admittedly was the highlight of my stop at Smarts. It truly was loaded in every sense of the word. The jalapenos inside added a nice heat to the meal. If they had some picante or better yet Sriracha on hand, it would have made my deal. Still, it was a really good breakfast burrito and something I’ll order again on my next visit. Next up was the Doughnuts. I ordered a half dozen doughnuts to take back for my co-workers to try with me. 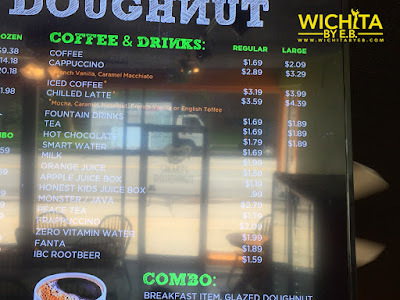 It was $10.34 for a half dozen and $20.18 for a dozen of their specialty doughnuts. 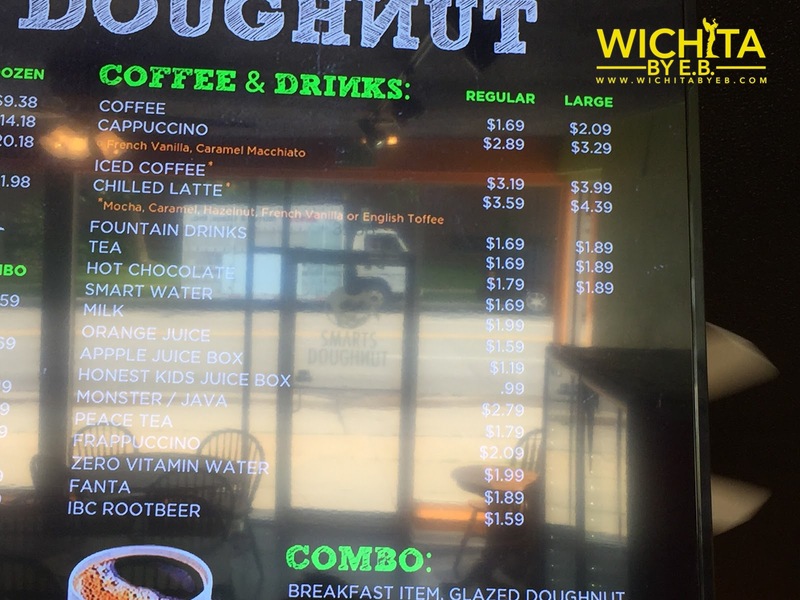 For comparison it’s $15 for a dozen and $10 for a half dozen of the specialty doughnuts at Hurts Donut. 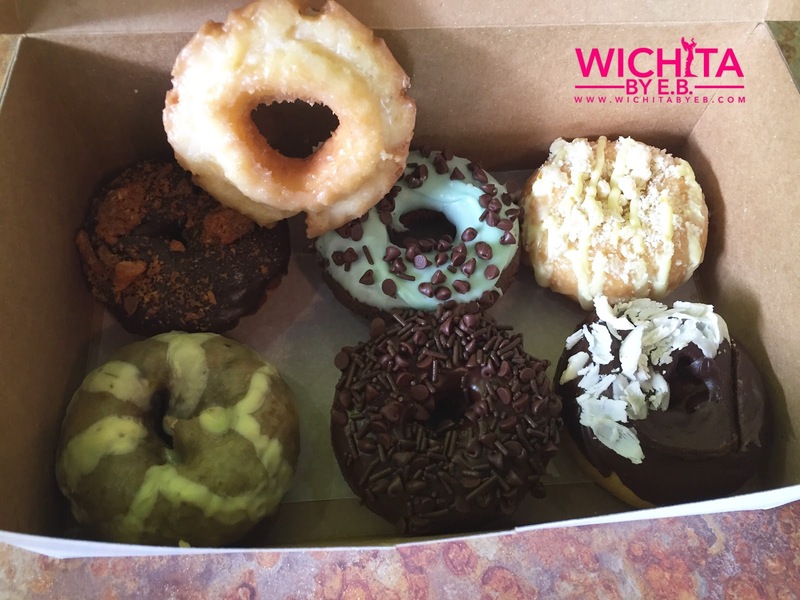 At lunch time, many of the specialty doughnuts had already been purchased. It’s like that at any doughnut shop you go to though. 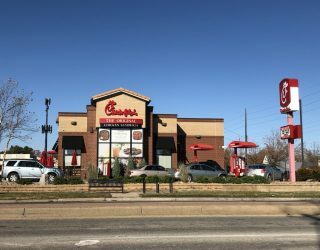 If you want the best selection you have to get there in the morning. I eventually went with the Lemon Streusel, Chocolate and White Chocolate, Chocolate Mint, Butterfinger, Blueberry Lemon, Chocolate Chip, and Classic Sour Cream. For safe measure, I added in a dozen doughnut holes. The doughnut holes were a hit with everyone. They were so soft and seemed to dissolve in your mouth once you bit in. They were gone so fast I forgot to take a picture of them. As for the doughnuts, the favorite by a mile was the Blueberry Lemon. The blueberry had a very distinguished taste. One person commented it tasted like Lucky Charms or Trix cereal. We cut up each doughnut into 5-6 pieces so everyone could try it and not a single person was turned away by the Blueberry Lemon. The other favorites by parts of the group were the Sour Cream which didn’t taste like sour cream at all. The Lemon Streusel was another favorite as well as the Chocolate Mint for those people who like mint. Overall nobody had a bad thing to say about Smarts Doughnut. If you like doughnuts in general, Smarts is another option in town for you. 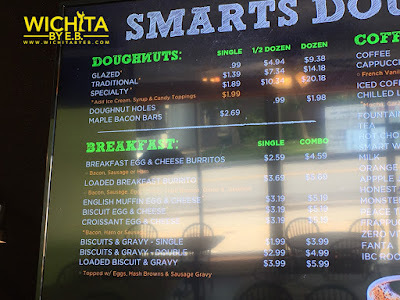 The one major gripe about Smarts is the $20 asking price for a dozen doughnuts; that’s by far the highest price in town. But remember, they are more than just doughnuts. There’s a good size breakfast menu to choose from.